When 4-year-old Melody walked into the Pontiac Academy for Excellence, she noticed one thing right away. “A stinky smell was in my school,” said Melody. There was no mistaking where the smell came from. "All the way down the hallway there were porta-potties. 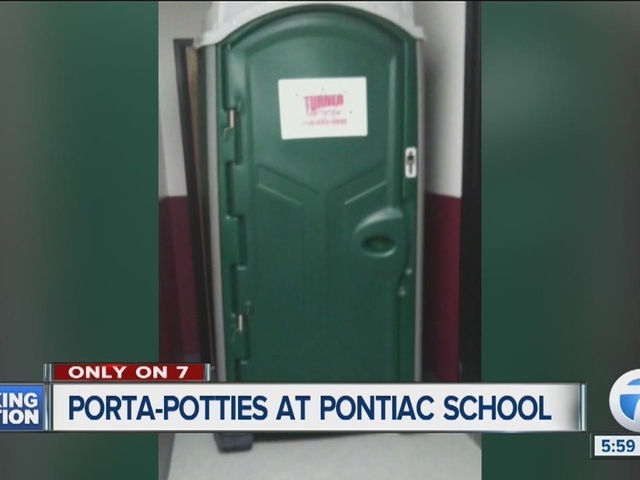 There were signs up saying, do not use restrooms or drink from fountains,” said Amanda Goff. Amanda said she asked if the children could be moved away from the porta-potties. She was told if her daughter was moved, other children would have to take her space. She asked how long this would continue. She says she wasn’t given an answer by school workers at the charter school authorized by Saginaw Valley State University. "The smell was overwhelming. My 4-year-old who loves school on a daily basis didn’t want to be there, because she said, 'mommy it smells so bad,'” Goff explained. Goff pulled her daughter out of school, called the health department, and shared what had happened on social media. “The landlord was doing a remodel, and didn’t want to inconvenience kids, so he had porta-potties,” said James Spruill, superintendent of the School. He says after parents complained, they took action. They removed the porta-potties from the building. The health department says while there is no specific law against indoor porta-potties, there are sanitation concerns. They release gas as they fill. Health department inspectors came to the school Wednesday in response to Goff’s complaint. By then, the school had removed them. Even with the remodel job underway, there are enough restrooms available for students to meet code. Inspectors found no violations. The school’s superintendent says he hopes Goff’s little girl returns to the school as a student. Goff says she wants to have confidence that any place she allows to care for her daughter has the highest standards of sanitation. She is looking into other schools in the area. “She is in preschool. This isn’t the memory she should have when just starting out,” said Goff.